Fingerling potatoes are typically finger-sized. Because they are small, they are excellent when roasted- the skin becomes perfectly crisp at the same time the interior is fork-tender. 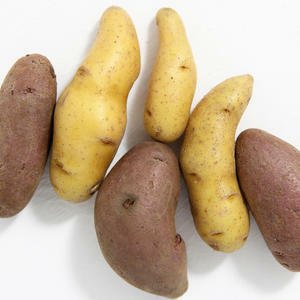 However, fingerling potatoes can be prepared the same way as any typical Idaho or Russet. Finglerling is more of a sub category than a particular variety- within the grouping there are specific types that have distinct colors, textures, and even subtle taste differences. Fingerling potatoes add an element of beauty to dishes. Pale gold potatoes can be cooked alongside deep purple ones to effortlessly add to a meal's color palette. Generally speaking, potatoes are part of many cultures' staple diets because they are nutrient-rich, providing needed Vitamin B6, Vitamin C, and thiamin.